The bridges in the photograph below stood side by side for only six years. The one on the left was built in 1937 while the old bridge on the right was reputedly erected c1300. It was dismantled in 1945. Both bridges in turn were known as the Pontardulais Bridge alias Y Bont Fawr. The Loughor/Llwchwr river flows beneath their arches. Pontarddulais, with a lenited Ddulais, suggests that the name of this village, located on the border of Carmarthenshire and the County of Swansea, has pont + ar + Dulais as its elements. These elements infer that a bridge spans the Dulais stream at this place. This is not a modern concept. Ponte ar theleys [an attempt at Pontarddulais] is recorded as early as 1557. In reality however, the ‘Pontardulais Bridge’ spans the river Llwchwr. The Elizabethan historian Rhys Ameurig [alias Rice Merrick] records ‘Dulais bridge upon Loghoure’ in 1578, while the Holingshead Chronicles (1586) has ‘Arthelais bridge over Logor’. A document dated 1550, is to be found in the Carmarthenshire Deeds at the Glamorgan Record Office, Cardiff. It gives a definitive Pen y bont aber Duleis. This early form clearly states that the bridge is near the confluence of the Dulais stream, and does not span it. With the passage of time, ‘aber’ was truncated to ‘ar’, and this in turn initiated an assumed Pontarddulais, accompanied by an erroneous etymology. The noun ‘aber’ does not induce a lenition in Pontaberdulais, later Pontardulais. E. Lewis Evans in ‘Hanes Pontarddulais’ (1949) popularised the mutated spelling of the place-name. He attempted to justify his etymology by claiming that the Pontardylais Bridge of 1756 (op. cit. p29) spanned the Dulais stream. This is clearly not true. The inventory for the 1756 repairs names the bridge as the Pontarylais Bridge and gives the causeway a length of 78 yards. Local poet, scholar and theologian John ‘Gwili’ Jenkins always favoured the Pontardulais form, as did the majority of the villagers of my childhood days. Pontardulais was hewn out of an earlier Pontaberdulais which is both etymologically and geographically exact. Pontarddulais was formed from a misconception. Put simply, Pontardulais is a short form of Pontaberdulais. In his authoritative book "Place-Names in Glamorgan" page 158, Gwynedd O. Pierce states "..clearly implying that the bridge, at the end of which the modern settlement grew, was over the Dulais at its confluence, W aber, with the river Llwchwr (Loughor)." This unfortunately contains a scribal error. Prof. Emeritus Pierce informs me that it should read ".....clearly implying that the bridge, at the end of which the modern settlement grew, was over the river Llwchwr (Loughor) near its confluence , W aber , with the Dulais." PS. Dictionary of the Place-Names of Wales p.387 states ..."the old bridge (still standing) which crosses the river Loughor".... This "old bridge" is the one on the right above which was demolished in 1945. It was certainly not "still standing" in 2007 [year of publication of DPNW]. 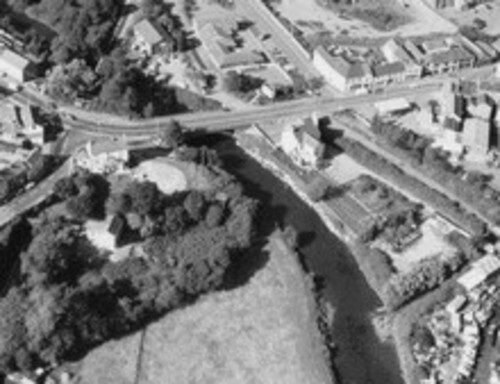 The photograph below shows Pontardulais Bridge in close proximity to the mouth [aber] of the Dulais stream, bottom right.